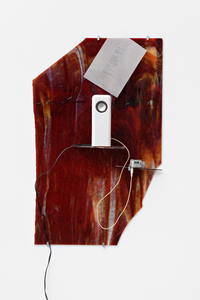 The artists Gerry Bibby and Natalie Häusler, both based in Berlin, weave their works of sculpture, installation and performance around text sources. Sharing the particularity of using a process that starts with words, the two artists produce an equally original conversation as a result of a fleeting encounter and an exchange of their writings and poems. here's the outcome: thoughts on the meaning of their respective practices, in a dense, poetic attempt to track down and explore common ground. engaging with an artwork sensorially and approaching it cerebrally. voices of the artist’s friends reciting poetry she has penned herself. close. The texts of the respective poems are printed on transparent paper and draped over the top of each shelf, softening the boundaries of the shelves and almost turning them into works of concrete poetry. The title of the show comes from case modification, the practice of altering the chassis of a computer hard drive in an attempt to show off some special or unique feature. While the only thing being modified in the gallery is the floor, and then only nonpermanently, the works in this exhibition activate the viewer’s capacity to transform a complex of sound, text, and art into his or her own artistically enjoyable experience. Bard’s MFA Thesis show proved worth the hot, dusty trip to the UBS gallery in Red Hook, NY—a pole barn transformed into a sizable exhibition space. The show featured all twenty-six members of the 2011 graduating class working with, and between, the mediums of drawing, installation, painting, photography, sculpture, text, and video. 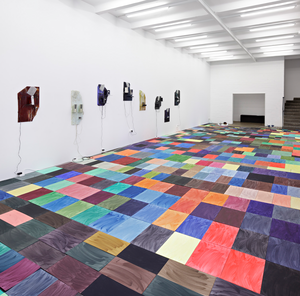 Natalie Häusler’s work would typically be identified as installation, however the artist conceived of her thesis project as a type of expanded-field painting. For the piece We are getting a little bit too close here, the artist examined interior design and architecture, borrowing marks and color palettes from tiles as well as cropped graphic forms found in educational institutions. Covering constructed walls, flooring, and shelves, her gridded and layered composition remains within, and strays outside of, self-prescribed bounds. Using disparate mediums such as laser prints, fabric, vinyl tiles, and acrylic paint, Häusler draws attention to the surfaces of these physical structures, while simultaneously delving into illusionistic space. Ultimately, the piece exhibits its own self-consciousness—calling attention to its context as an institutional site of art education. 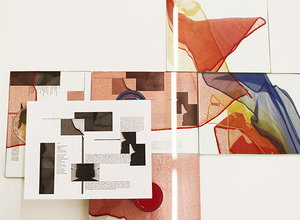 A selection from Chris Austin’s Notations project, on display in a dedicated room, belongs to a highly sculptural strain of contemporary photography. The project draws from an archive of 501 black and white photographs shot at the artist’s childhood home in Chicago over the past seven years. An image of the backyard, Untitled, is the largest and most prominent. In it, a central form that appears to be both static and moving is shrouded in black cloth and surrounded by fallen leaves, barren tree branches, and a blank white sky. Other smaller pieces in the series are multiple-exposure amalgams of shots taken from different vantage points inside of the house—the additive results of 27, 35, 59, or all 501 photographs generate curious and minimal geometric forms. The blurriness of their edges and status as abstraction supports Austin’s aim—to create a kind of prosthesis for memory, while delving into the murky space between what is tangible and intangible. He trades in mystery and obscurity, resisting full disclosure of his subject matter. The aesthetic is dark and ominous, presenting memory, time, and space as unknowable, otherworldly specters. Reminiscent of Postminimalist Gordon Matta-Clark’s (and more recently, Monica Bonvicini’s) propensity for breaking surfaces or slicing through architecture, Adam Marnie enacts smaller, serial acts of aesthetic destruction that engage both the mechanisms of photography and the languages of sculpture and painting. In the main UBS gallery, his Camera Incidere spans four walls spaced at set intervals. Together, the walls and the artworks hung on them manipulate the distance between a windowed roll-gate and a large photo-collage at the back of the room. Each of the intermediary walls are linked by mounted drawings and photographs that breach their own frames, display constructed fissures in drywall, and allow the viewer to gaze through aperture-like peep-holes. The work changes according to the conditions of the gallery—the amount of light at a given time of day alters the overall effect. As its title reveals, the piece is, in part, an investigation of optics and the act of looking. Given that “incidere” means to incise, affect, or record, it is as if Marnie has materialized the impact of light—leaving its imagined, forceful trace on sequential partitions. © 2010 – 2019 Natalie Häusler. All rights reserved.